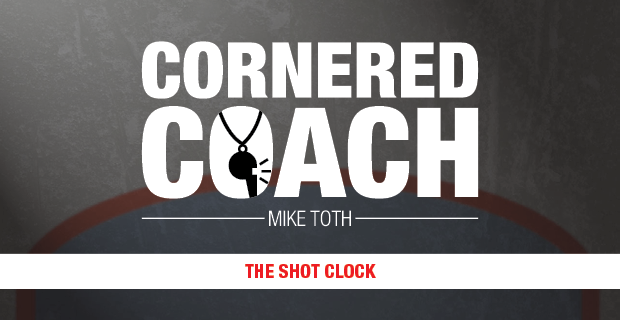 What's the perfect number of shots for a goalie to face? If you ask me, I say zero. As I've mentioned in this blog before, I was a goaltender in my younger days; not a great one, but good enough to play some junior and college hockey, mostly as a back-up. While most netminders worth their salt would claim the more rubber that comes their way the better, I was the exact opposite. I wanted to win and realizing that, in my case, more pucks equaled more goals, I was quite content to do as little as possible in my end of the rink. My first ever college hockey game, playing for Red Deer College, I faced a grand total of one shot in a 22-0 victory over Medicine Hat College, a school that was in the early, and ultimately failed, stages of starting a hockey program. That was fine by me, as it definitely helped lower my hefty goals against average. On the other hand, as discussed above, most goalies crave more work. My 10-year-old son is a goalie for a Toronto AA Atom team; a solid squad that ensures that, while my lad gets a decent number of pucks coming his way, he's not seeing black biscuits as he tosses and turns at night. But there's another team in the league that does give up a ton of shots and, as you might expect, doesn't win a whole lot. That's just fine with the goalie and his dad. What a character that goalie dad happens to be. A big, gregarious fellow who moved to Canada from Russia a few years ago, he's one of the most entertaining hockey people you'll come across. "Our team is not very good," he told me once in his proud Russian accent. "Every time we get the puck out of our own end, I take a drink of vodka to celebrate!" But playing for a struggling team is exactly what my friend was looking for. His son, you see, is a sensational goalie – in my opinion, the best in the Toronto AA loop. He's had plenty of offers to jump up to the AAA ranks, but his dad realizes there's no rush. He wanted his son to see as many pucks as possible before making the AAA leap in time for his Minor Pee Wee season. And he definitely found what he was looking for, as his little guy is in the middle of a shooting gallery on a nightly basis. Sure, his team doesn't win a whole lot. But the tiny masked marvel dives all over the place making sensational saves, ensuring that the score is usually a lot closer than it really should be. When you have almost no chance of winning, the goalie isn't under that much pressure to make the big save when it really counts. Hall of Famer Ken Dryden was often criticized for being "overrated" when he suited up for the powerful Montreal Canadiens. True, Dryden didn't face a ton of shots performing for a talent-heavy squad that captured an incredible four straight Stanley Cups during the 1970's. But he did play in a pile of big games and often had to come up with a couple of crucial saves – all the more challenging when you've been standing in the crease twiddling your thumbs for most of the evening. Still, there's plenty of time to learn how to handle "big game" pressure. As long as a young goalie doesn't get discouraged by consistent losing, facing a pile of pucks in your formative years is an excellent way to develop a solid goaltending base. I preferred as few pucks as possible. Which is obviously the reason I spend my time these days writing about goalies, while my old leather pads collect an enormous pile of dust.